The Zray A1 9’10 Inflatable SUP weighs in at an incredibly portable 21.3lbs and being inflatable it can be easily rolled up to the size of a sleeping bag, perfect for storing in a backpack. In this Zray paddle board review, we’ll be looking at what customers think, its stability, and its features to help you make a more informed purchase. Once inflated the board stands at 9’10” tall, 30” in width and 6” thick, making it an ideal size for one rider. Despite being inflatable, the Zray A1 iSUP is exceptionally durable, being constructed out of ding-resistant, military grade materials that will hold up against even the harshest conditions. Zray is famous for the quality of their products, creating paddle boards, kayaks, and even small boats. They pride themselves on the premium quality of the materials that they use, ensuring that you enjoy a high-performance, fun but most importantly, safe, ride. The A1 Inflatable SUP comes with a three-fin system that’s going to give you huge amounts of control over your direction. This is ideal for beginners who might lack the skills and coordination to maneuver a single finned paddle board. Likewise, the three-fin setup is perfect for more advanced riders who need the responsiveness of the extra fins to allow them to perform complicated tricks and maneuvers. While many beginner’s boards are only single fin, by giving you the option of three fins this board has a much longer lifespan. You can use it as a complete novice and still enjoy it once you’ve learned more skills and are attempting complex maneuvers. Being 6” thick you get a huge amount of buoyancy, making for an exceptionally stable and steady ride. This makes learning more interesting and less frustrating for beginners of all sizes, with this SUP holding riders up to 264lbs. The size of this board prohibits multiple riders, but it makes for a great beginner’s board because the extra length and depth help to stabilize the board. Whether you’re paddling on a flat lake or out in running water or surfing the waves, the Zray SUP will hold steady. If you’re only ever going to ride your board on flat water, then you might never notice the stability, but if you intend to ride on rougher days, then it’s critical. Without the extra volume of the Zray SUP, you’ll rock and tip under the choppy waves, making for an unpleasant ride. One of the biggest worries that customers have with inflatable stand up paddle boards is that they think that they could deflate or pop. In reality, the Zray Inflatable SUP is made from incredibly tough, military-grade materials that are ding-resistant. This means that even if you are riding alongside rocky shores, you can be confident that your board will be able to take the beating. The outer skin itself is 6-inches in thickness, providing a protective outer shell to the inflatable balloon inside of the board. Inflatable boards are often a much better choice for riders who don’t live near to the water that they surf because they are far easier to store and transport. Rather than carrying a bulky and sizable board, you can roll up the durable outer skin and inflate it on the shoreside. 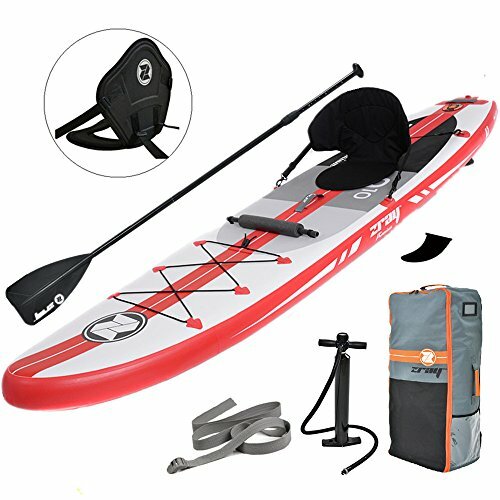 This package comes with a backpack which is specifically designed to carry the rolled-up skin of the paddleboard. Once inflated the board weighs only 21.3lbs, but because of the high-quality materials that are used, it can carry up to 264lbs of weight. Due to the quality of materials that have been used in producing this board, if properly taken care of, there’s no reason why this couldn’t last for a lifetime. The inflatable chamber within the board is specially designed with a Drop Stitch material that allows it to carry a higher weight, even from such a lightweight material. The chamber inflates up to 15psi, which is nearly discernible from a traditional rigid stand-up paddleboard. The outside of the chamber is protected with a three-layer laminated material, consisting of a polyester mesh with tough and durable PVC on the top. This is what gives the Zray Inflatable SUP its strength, rigid feel and lightweight. Easy to store and transport – Being inflatable you can roll the skin of the paddle board up and both store and transport it in the backpack that it comes with. This makes it ideal for riders who live further from the lake and who must drive or walk there. Similarly, if you live in a smaller house or flat, it makes storage a breeze. Durable – The Zray Inflatable SUP is crafted out of premium military-grade materials that are ding resistant. This is crucial for an inflatable board because it protects the inner balloon that inflates with air. Versatile – At 9’10” and with a capable weight of 264lbs, this board is extremely versatile. Not only can it carry a huge range of weights, but the volume of the board creates a huge amount of buoyancy, which will make it exceptionally stable. You can paddle, relax, do yoga and even tackle the local river or small waves. Maneuverable – With a full three-fin setup you have total control over the direction of your board. This can help beginners to maneuver more efficiently, and it also gives them the freedom to try more advanced tricks and movements once their skills have developed. Unlike many beginner boards, the Zray SUP is ideal for novices and professionals, making it a great choice for people who are serious about getting into paddle boarding. Full kit – This package comes complete with everything that you need to go from your house to the lake (except perhaps a car! ), including the board, pump, fins, paddle, backpack and more. All of these parts make this a perfect choice for a newcomer to the sport. Having read through a huge number of reviews, it’s clear the number one reason why customers love the Zray Inflatable 9’10” SUP is because of its portability. They like that you can throw it in the backpack and pump it up on the shore. Compared to traditional boards this is incredibly convenient. One reviewer commented that this made it ideal for riders that wanted to tackle off-the-grid lakes that required hiking to get to. Being inflatable, it only weighs 21.3lbs, comfortable for almost anybody to carry. As well as being portable, the reviewers also commented on the ease of use. The pump seems to be incredibly simple to start, and within five minutes you can have the board inflated and in the water. One of the few negative points was that the package didn’t come with complete instructions and this meant that the user had to call the customer service line. However, she goes on to say that they were able to rectify the situation quickly, making the pump work. Depending on whether you’ve ever had an experience using a pump or an inflatable board, you might need to watch an instruction video. Fortunately, there is an insightful video on the Amazon product page which shows you how to inflate and deflate your paddle board. This kit comes complete with a paddle that is in two sections. The customer noted that the handle is extendable, a feature that is often overlooked, meaning that it can be adjusted to your height, allowing children and parents alike to enjoy the board. This is an ideal choice for beginners to the sport who are looking for a portable, reliable and steady board that is going to grow with them as their skills improve. In this Zray paddle board review, we’ve shown that this is an excellent SUP that’s simple to inflate and use. Despite being an inflatable board, it’s surprisingly tough and durable. Zray has prioritized the build quality, refusing to skip any corners and choosing to use premium military-grade materials to deliver you a board that will stand up to dings. Perhaps the best part of this product is the kit that it comes with. Specifically aimed at beginners, the kit includes everything that you need to get out on the water and fully immerse yourself in this sport. From the pump and paddle through to the backpack and footrest, this kit is made for a beginner that doesn’t have any kit yet. As you practice and learn more skills, you’re likely going to want to start trying out some tricks and maneuvers. Rather than only using a single fin, the Zray board has three fins, giving you superior control over the board. This control helps to add value to the product by extending the lifetime of the board, making it a fun option for both novices and experienced riders.